When Verdezyne said last year it had made adipic acid in the laboratory, the Carlsbad, CA, industrial biotech said its eco-friendly fermentation process could make the valuable chemical for 20 percent less than it would cost a conventional petrochemical plant. Today, Verdezyne says it is now operating a pilot plant in Carlsbad that can make adipic acid at an estimated cost savings of 30 to 35 percent. Using genetically engineered yeast and raw material from palm oil and other renewable sources, the facility is making “multiple kilogram” batches of adipic acid in production runs that take roughly 100 hours, according to Verdezyne CEO E. William Radany. “We’ve done some significant metabolic engineering to come up with [yeast strains] that give us a significant cost advantage” in making petroleum-based chemicals, Radany said. In a statement issued by the company today, Radany says Verdezyne’s pilot plant represents a key milestone in the development of a sustainable replacement for adipic acid, an important petrochemical product. “This is the first demonstration of the production of bio-based adipic acid at scale from a non-petroleum source,” he says. 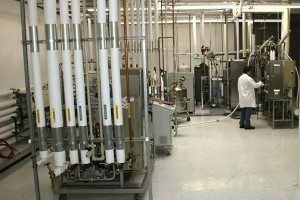 After raising an undisclosed amount of capital in May, Radany says Verdezyne built the pilot plant to optimize the processes needed to move to large-scale commercial production of adipic acid, a so-called “intermediate chemical” needed to make nylon 6,6. As I’ve reported previously, Verdezyne has taken a circuitous route to reach this stage. The company, which now has 46 employees, currently has enough cash for its operations, but will need to raise another round in 2012, Radany said. Verdezyne’s current investors include BP Alternative Energy Ventures, DSM Venturing B.V., OVP Venture Partners, and Monitor Ventures. Verdezyne says its “green” adipic acid is identical to the petroleum-based polymer, and can be used to manufacture the nylon used to make clothing, carpets and other textiles, as well as polyurethane resins and engineered plastics. The company estimates the global market for adipic acid at more than $6 billion a year. “The main goal of the pilot plant is to continue to validate your economics and your processes,” Radany told me recently. He described the facility as a fully integrated operation that will be used to optimize a variety of processes, including the ideal mix of ingredients and production cycle, as well as the filtration and separation of adipic acid from the fermentation broth. Verdezyne says its proprietary yeast constitutes about 10 percent of the broth in a fermentation tank. The yeast consumes inexpensive “fatty acid distillates” and produces nearly 100-percent pure adipic acid, Radany said. He described the raw material as “non-food vegetable oils” that are typically sold at a low cost to soap manufacturers. The company says its production methods also generate less carbon dioxide and other pollutants compared with conventional petroleum-based production.